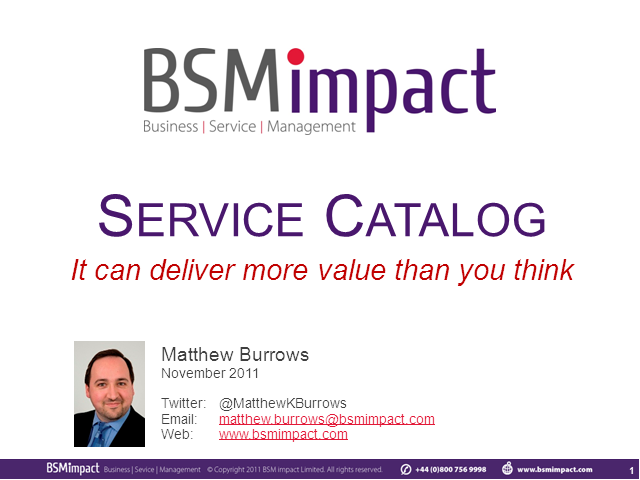 Many of the organizations who have a service catalog get limited value from it. Sometimes it fails to represent what the customers or our business colleagues get from us in terms they understand and other times it only covers the user-request-able services. As someone who has built hundreds of service catalog and service portfolios over the years helping organizations get the maximum value from them, Matthew Burrows is ideally placed to give some practical tips which you can apply in your own organization. This session will not only explore why you need a service catalog, it will put it in context, explain how to get value from it and how to use it as a spring-board to deliver even greater service management maturity and tangible business benefits.